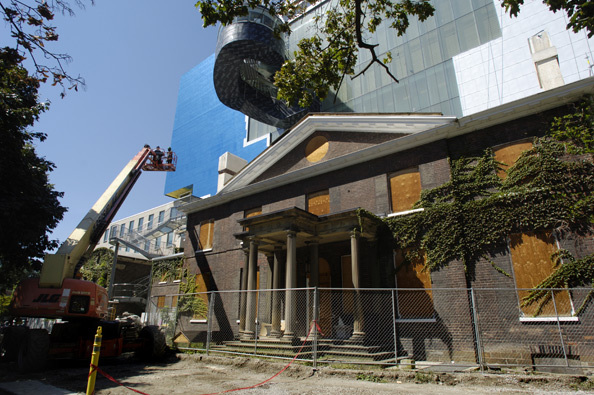 With the reopening of the Transformed AGO, The Grange has shed its protective covers as well. AGO members are now welcome in the Norma Ridley Members’ Lounge that occupies part of the ground floor of the historic building. The stylishly renovated space provides an ideal ambience to relax and contemplate over refreshments, with a picturesque view of Grange Park. Other parts of the building are once again accessible to the general public. This includes the Main Hall with its large, 19th century painted, etched window displaying the Boulton family crest, the Goldwin Smith Library and the historic basement. Site coordinator Jennifer Rieger notes that “The Library is now much closer to its original state, with the addition of a large bequest of historic books that has been added to the shelves.